If you've ever considered bringing home a small furry pet, you've probably considered a ferret. Pouncing and playing, hiding your keys, or snoozing in a pile of fluff, ferrets will easily win you over. 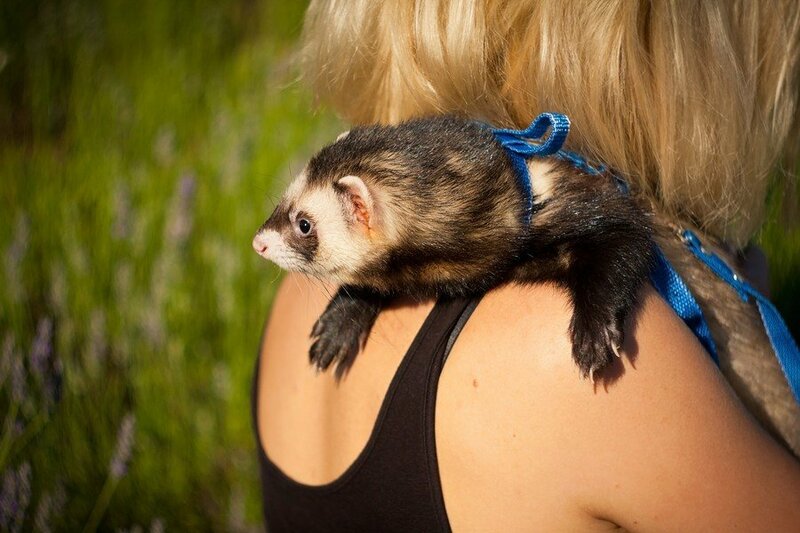 With a ferret's intelligence and jester-like antics, they do make wonderful pets. However, a new ferret takes a lot more time and experience than most people realize, which doesn't make them ideal for a new pet owner or for a house with small children. Most people assume that ferrets are rodents and the word rodent often makes people turn up their nose. But they aren't rodents. They are a part of the Mustelid family, cousins to otters, minks, and weasels. Ferrets are incredibly intelligent and with proper and consistent training can learn tricks, litter box training, and kind behavior. Just like puppies and kittens, they need to be taught the basics. Along with being taught proper bathroom habits, they also need to be taught not to nip and bite humans. Young ferrets need around four hours per day out of their cage to explore, play, and socialize. If they have cage mates, this time can be lessened to two hours a day, minimum, since they'll have a partner. Playing with your pet ferrets is the best way to bond and very crucial to their well-being. They are very social animals! Free roaming time is important, as is the "ferret-proofing" process if you want to keep your house, and sanity, intact. Think of ferrets as curious toddlers with the attention span of a kitten. They like to get into EVERYTHING. They like to nest and burrow in couches and recliners, play with and chew on cords, and take your things and hide them in small spaces. It's no wonder they are related to weasels! Anything they can get their tiny pink paws on, they will. Ferrets love phone chargers, socks, electrical cords, hair ties, jewelry- they think everything is free for the taking, which is why they need constant supervision. Ferret-proofing your home just means you have to clean up your knick knacks more thoroughly. This intense curiosity and desire for mischief means... these social creatures are busy! After you've bonded with your ferret and they know you as a friend and companion they might snuggle while they sleep, but when they are awake they are on the go! , ear/teeth cleaning, flea prevention, and a bath no more than once a month. Everyone wants a healthy ferret! Ferrets eat ferret food or pellets, often sold in pet stores. They must have the proper amount of protein in the meals, which can usually come from canned kitten food, meat-based dog food, or raw meat, like chicken. Just make sure that meat is the primary ingredient as ferrets are carnivores. Avoid any carbohydrates or grains. They love extra treats which can range from cooked egg to cat treats to different meats like turkey or lamb. Also make sure they always have access to fresh water. If you plan on having ferrets, it's critical to get them spayed or neutered. Female ferrets stay in heat until they mate, and if they don't mate it can lead to detrimental health conditions and potentially high vet bills. 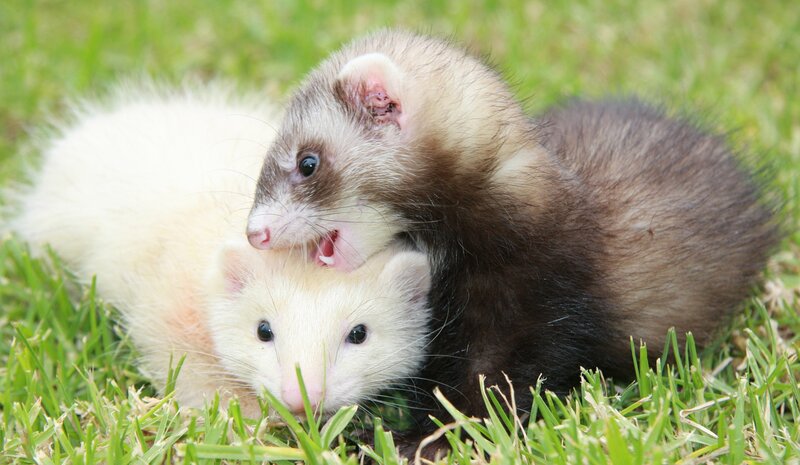 If male ferrets aren't neutered, not only do they tend to smell worse, their temperament changes. It's best for you and your pets to have them spayed and neutered. With a lifespan of 7 to 10 years, you should know that they'll need you to care for them and love them for years to come. Many people bring home ferrets thinking they'll live for a couple years and after realizing they live for much longer, re-home them. After putting the time and energy into bonding with ferrets, it's best to make sure you can provide them with a forever home. Then there's the smell. An unaltered male does smell the worst, but ferrets in general have a musky odor. This is caused by glands in their skin that gives them that musky scent. Daily cage cleanings are a great idea, and help keep some of the other odors down. If you live somewhere where the weather is above 80 F regularly, ferrets aren't your best bet. They prefer high 60s and 70s, or else they could overheat easily. It is also illegal to own ferrets in certain areas, California being a good example, so make sure that you look into your local laws for exotic pet ownership. Ferrets are silly and playful, both with cage mates and humans. They're quiet and spend a lot of time sleeping- when they're not playing, that is. With time and patience, you will find yourself with a funny, loyal, smart companion that wants all your love and attention. Make sure that you do ALL the research before becoming a ferret owner, especially one with specific training requirements. You can also consider being a forever home for an older ferret; maybe one that is being re-homed. Make sure you know why the ferret is being re-homed, and their history. This might save some of the initial training you'd have to do with a baby kit, and would provide a loving home for a rescue pet in need. Do you have a ferret? Tell us about ferret ownership in the comments below!